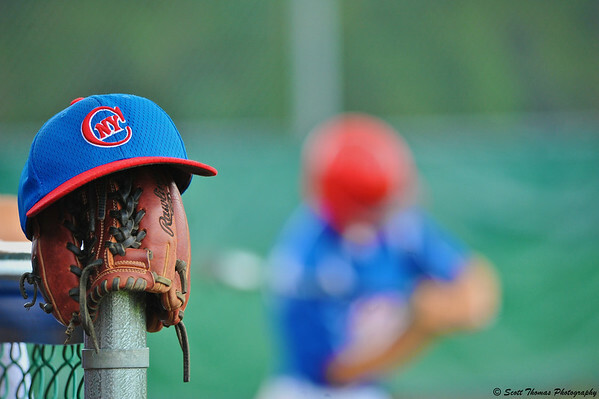 Baseball cap and glove sits on a fence near the dugout as a player swings a bat waiting for his turn at bat. Maybe a tighter crop would help. Ignore the cut off watermark, please. 🙂 Better? Worse? A different crop of the original photo. 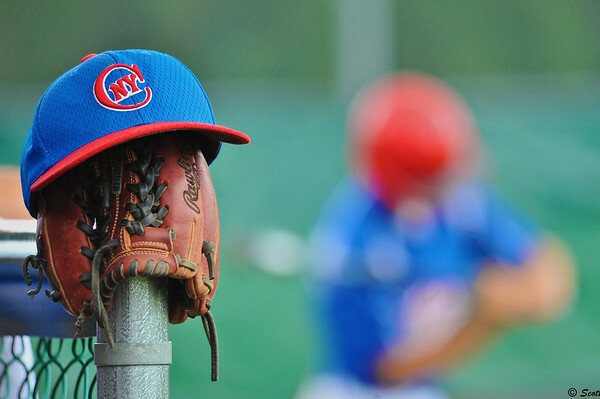 This entry was posted in Sports and tagged 80-400mm, baseball, bat, batter's box, bokeh, cap, crop, fabius, fence, game, glove, new york, nikon D700, player, vr. Bookmark the permalink. You know, I do not remember seeing any beat-up looking equipment. The caps for this team looked new. The batting helmets did. I guess these guys are well funded (ie., parents). I might try something with this photo when I get a few minutes. Yeah, I prefer the cropped version. More emphasized.. I think it’s a well-thought-out photo composition—definitely says “baseball.” I like the cropping in photo #2. I like the composition in the first image, and think you are right that a little more detail in the batter would be effective. I think the problem is that the background is an action shot, and somehow action demands to be “seen.” I’m not making myself very clear. OK, here: If the background were an equally indistinct but recognizable scoreboard, for example, I think it might work better. There’s something “wrong” about the cap and glove hanging there while someone is batting. Interesting you feel it wrong about the hat and glove with a batter as both are not used when a player is at bat or running the bases. A batter’s hard helmet is used then. Your other points are well taken. Not sure when I will have another chance, Tracy. These teams are on the road for the rest of their summer season. Since I was using the 80-400VR, I shot this at 1/320s, f/5.3, ISO 900 and 280mm focal length in shutter priority mode. I had lots of room to work with the exposure settings since this was a still life and the background motion was not fast with the batter stopping at the end of each practice swing. Could have stepped down to f/11 easily to bring the background more in focus but still separated. The size of the objects. Hmmmm…telephoto compression played a big role there. Could have backed out on the zoom. Will remember that next time I have a similar opportunity. Thanks everyone for this discussion. You do learn from the photos we take that are not great, too. I agree, this would have been a better photo if you had used a smaller aperture, BUT, it’s not so off that you can’t tell that this is a player in the background. Thanks, Michaela. I found a better one which I posted on flickr this morning. I LIKE it! The first way. Don’t love the crop. Love the bokeh, all fuzzy and indistinct. The colors are gorgeous, the hat perched on top of the glove, “well spotted” to quote our British friends. I’m not a photographer, but I prefer the original version. to my personal journal through my viewfinder. A place where I leave the world behind and try to find the spirit of what I am seeing. Feel free to look around at all the posts and pages. If you'd like to borrow a photo(s) for your non-commercial blog or website, be my guest. Please, do not alter the photo(s) and be sure to link back to this blog with a prominent photo credit(s). Thank you and I'm thrilled you dropped in! View 34: Why do Birds stand on one Leg?